Over 200 people attended Building Our Bridge: Our Journey to Reconciliation at the Stockey Centre on November 9th to support student’s work at Parry Sound High School. The book was read at area elementary schools to over 700 students, many of whom attended the event with their families. Each page of the book was read and projected on screen, while students acted out parts of each scene. The drum was the beginning of cultural reconciliation at the school, and drummers sang at key points in the reading. They accompanied the dancers on stage, to symbolize the pow wow that is organized at the school by Indigenous and non-Indigenous youth. 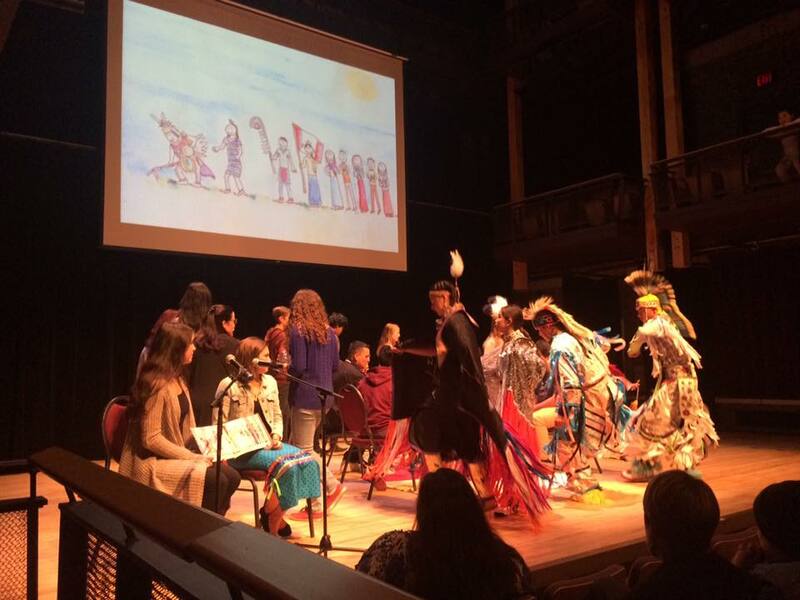 15 members of the community honoured, with gifts and an Honour Song. 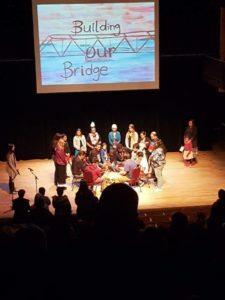 Honourees were invited to say a few words, and they congratulated the students on their efforts and their belief in peace, respect, and friendship as embodied in the original Treaties. They recognized their ancestors for passing on teachings, and spoke about the next seven generations to come in our community. Five student co-authors were gifted a copy of their book by teacher Patti Jenkins. On November 15th, they read it to thousands of youth at Me to We, Ottawa. A video of the Stockey Centre performance can be seen here. The event was sponsored by GBBR’s Canada150 grant, donations received will go to future youth programs.